NEW YORK Fewer Americans signed contracts to buy homes in February, but the level stayed near a three-year high, and analysts believe sales of previously occupied homes will keep rising in the coming months. The National Association of Realtors said Wednesday that its seasonally adjusted index for pending home sales dipped to 104.8 in February. That's down from January's reading of 105.2 - the highest since April 2010, when a homebuyer's tax credit was boosting sales. Signed contracts are 8.4 percent higher than a year ago. In February, completed sales of previously occupied homes rose to a seasonally adjusted pace of 4.98 million, the fastest in more than three years. The gains in both signed contracts and completed sales point to a housing recovery that is strengthening, although re-sales remain below the 5.5 million that are consistent with healthy markets. Steady hiring and near record-low mortgage rates have encouraged more Americans to buy homes more than six years after the housing market started to collapse. More people are also moving out on their own after living with friends and relatives in the recession. That's driving a big gain in apartment construction and also pushing up rents. 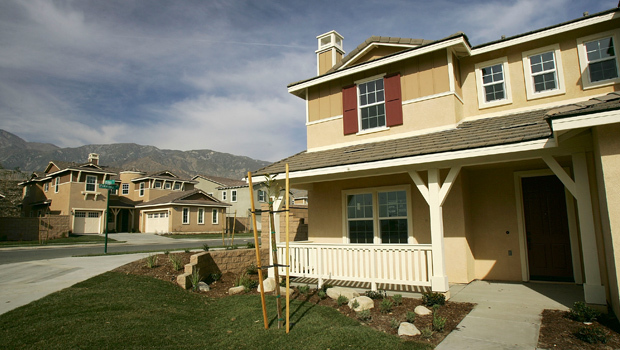 Pending home sales rose 0.4 percent in the Midwest and 0.1 percent in the West last month. They fell 2.5 percent in the Northeast and 0.3 percent in the South. One concern is that a shortage of available homes is limiting sales in many markets. More people are also starting to put their homes on the market, which could help sales in the coming months. The Realtors' group last week said that the number of available homes for sale rose 10 percent last month, the first monthly gain since April. Even with the gain, the inventory of homes for sale was still 19 percent below a year ago. A limited supply of homes for sale has helped drive prices higher. U.S. home prices rose 8.1 percent for the 12 months that ended in January, according to the Standard & Poor's/Case-Shiller 20-city index. That's the fastest annual pace since June 2006. Prices rose in all 20 cities surveyed and eight markets posted double digit gains. Stable price gains should encourage more people to buy and put their homes on the market, keeping the housing recovery going. And higher home prices make people feel wealthier, which leads consumers to spend more and drives more economic growth.